Passover holiday - Ready to ship items will be delivered only on May 2nd. Happy Holidays! Yellow and White gold process time is about 1-2 weeks. Rose Gold process time is about 2-3 weeks. Items Ready to ship: 2-7 business days. 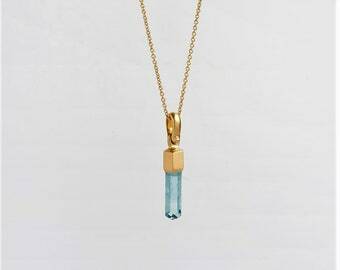 Contemporary and Handmade Fine Jewelry made of 22k, 18k and 14k Gold from Nirit & Avi Berman in Israel. 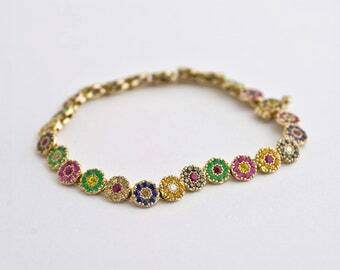 Berman Designers specialize in jewelry combining gold, diamonds, gems and ancient coins. ❥ http://www.BermanDesignersMens.etsy.com - Men's Jewelry - Kinetic Rings, Unisex Pendants. ❥ http://www.BermanDesigners.etsy.com - Fine Jewelry - Gold, diamonds, gems & ancient coins. Let us know if you need your order faster and we will do our best! Each item is based on our philosophy; We believe a piece of jewelry should be a concentrated nugget of beauty as well as a collection of carefully selected intelligent solutions. the stories and experiences that attach to it with time. This small object is an amazing work of art. The ancient coin is paired with a tasteful, artistic and beautiful modern setting and the two compliment each other perfectly. I had been searching for an Athenian Small Owl Coin for some time as it has a lot of meaning for me. When I found this one, I was in love! This Studio is remarkably talented and their work is easily the best I’ve seen from anyone anywhere. This small, beautiful work of art will be my beloved talisman for years to come and be passed down through my family as a treasured keepsake. I can’t thank you enough for making this dream come true for me! I am so impressed with the quality of this shop’s jewelry. Dainty, yet solid and sturdy and modern. "Behind every polished and perfect piece of jewelry is a pile of ideas, attempts, mistakes, curiosity, enthusiasm, and all the other components of the creative process. For us, they're just as fascinating as the final product". We are a couple that has been working and creating together for decades. We each have our individual areas of interest and expertise, but are united in our love for our shared work. In work as in life, all these elements blend together to create the unique texture of our business. Nirit studied jewelry design at the Bezalel academy for arts and science, and later became a qualified Feldenkrais practitioner. The natural connection she sees between jewelry and body movement finds its expression in every piece. Avi has extensive technical skills and excellent sculptural vision. He is responsible for many of the clever apparatuses and structures that have come to define our jewelry. Nirit keeps her antennae up, learning about new developments, bringing in new ideas every year. Avi explores new technology without giving up the craftsmanship angle. Nirit is the person you'll usually meet when you come into the studio, maintaining the personal connection with the clients. Avi, with his three-dimensional vision and extensive experience, will join the meeting to develop complex, extraordinary solutions. Over the years we worked on many projects, have showed our work in exhibits at home and abroad, sold to celebrities, met different artists and learned from experts in various fields. Still, we kept our rustic sensibilities. We love working and living in a country setting, with the lovely view of the valley a few steps away, each season decorating our garden with new inspiration. All our jewelry is designed and manufactured in-house, including the setting. This tranquil environment is conducive to the practice of our art and inspirational for our designs. I studied jewelry design at the Bezalel academy of arts and design, and later became a qualified Feldenkrais practitioner. The natural connection I see between jewelry and body movement finds its expression in every piece. I have extensive technical skills and sculptural vision. I am responsible for many of the apparatuses and structures that have come to define our jewelry. I am Nirit and Avi's daughter. I will probably be the one who will answer your questions. I am also a designer and run my own ETSY shop called www.etsy.com/shop/NogaBerman. 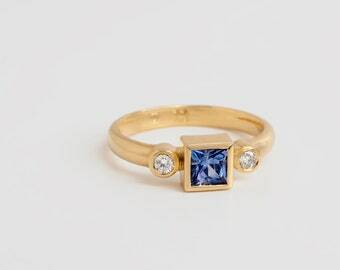 Hi, Welcome to our Etsy Shop, specializing in engagement, wedding and gold jewelry combining gold, gems and diamonds. Berman Jewelers is a family business started 30 years ago. We are a couple that has been working and creating together for decades. We each have our individual areas of interest and expertise, but are united in our love for our shared work. In work as in life, all these elements blend together to create the unique texture of our business. At our shop you can find 22, 18 or 14 karat gold rings, bracelets, pendants and earrings, design and manufactured by us. Please check our second shop: BermanDesignersMens.etsy.com. If you are unhappy with your purchase, please contact us right away (within 7 days of receipt) so we can work together towards resolving the issue. If needed, the item can be exchanged for something else, or returned for a refund, minus shipping costs in both countries. Please return the item, unused, in its original jewelry box, and insured for the full value of the piece, within 7 days of when you received the piece. We will process the refund as soon as we receive it, in its original condition. Custom orders and personalized jewelry are non-refundable and non-exchangeable. We are sure you understand! However, we will work with you to try and resolve any issue you may have. We make every effort to carefully choose pictures and describe each item exactly as it is. In the rare instance that your item is not as described please message us within 7 days of receipt and we will review your request. Most of our products are hand-made to order and created specifically for you. If you have any questions, concerns, or would like more photos or item descriptions, write to us before placing any orders. We do not accept returns or exchanges on resized rings. All ready to ship items, with no changes made to the original item, are returnable for a full refund minus shipping costs in both countries. Delays in returns or damaged returns can affect your refund amount. We will cover all shipping charges for return of an item "not as ordered" if it's our mistake. Approved refunds are not processed until we have received the item and verified it is in the same new, unworn condition as when shipped. Customs fees are not refundable. Refunds are processed back to your original method of payment. Delayed returns (over 14 days) of any items, including "ready to ship" items will not be eligible for a refund. Please do not return items without authorization. Please read descriptions, measurements and size directions carefully, we do our best to provide accurate photos and fully describe each item clearly but because each item is hand made there might be slight variations from the picture. Items produced specifically on request and custom-sized rings are non refundable and cannot be exchanged. We strongly suggest getting sized at a jewelry store before ordering to avoid this. * Unusual situations will be handled on a case by case basis. Please contact us with any concerns. * Rings made to size, are subject to a 30% restocking fee. * Hand engraved, personalized items, custom orders and personalized jewelry are not eligible for return. We recommend shipping returned merchandise via insured parcel post for tracking purposes and that the customer request adequate insurance to cover the purchase price of the shipment. We will not assume responsibility for reimbursement or compensation in the event that return packages are lost, stolen, or mishandled. Shipping charges for any returned item(s) are the client’s responsibility. *Customer pays return shipping for exchanged item. For custom made to order jewelry, please read descriptions and ask in advance if an item you are ordering is returnable or can be exchanged. * We reserve the right to refuse return of any merchandise that does not meet the above return requirements in our sole discretion. 1) Contact us first! we will be able to provide you with more detailed instructions! 2) When mailing the item back to us - if sending internationally from the United States or elsewhere, please be sure to mark the item as 'RETURNED MERCHANDISE' on the customs form and please use your country's postal service to send it. *Please do NOT send returns via UPS, FedEX or any other courier, as they attach brokerage fees the item will be returned to you. 3) We will notify you as soon as we receive it and then provide your refund or send out the exchange piece. We accept PayPal payments only, a secure online payment system which is very easy to use. You may already have an account. If not, you don't need to have a PayPal account in order to pay. You can pay with your debit or credit card directly on the PayPal site, as a PayPal guest. For wholesale orders – please contact us for more details. Payment is expected immediately after order is placed. Please contact us if there is a delay or problems with PayPal. We are happy to arrange a lay away payment plan for items totaling over $400. Contact us for details. Item must be paid in full before shipping. Lay away payments are accepted on an agreed upon schedule to be preferably not more than 3 payments total. Longer payment schedules can be arranged for higher priced gold and diamond items. We are shipping overseas. Please take into account shipping times. Shipping times can vary greatly from country to country and take anywhere from a few days to several weeks to arrive. 'Ready to ship' orders ship within 2-7 business days of payment received. 'Made to order' orders ship within 1-3 weeks of payment received. Eco Post Shipping - This option is FASTER than the standard registered mail. Airmail shipping times are between 7-14 business days. It should be noted that Eco Post is not a courier service and therefore does not require the signature of the recipient at the time of delivery. * Available for: Australia, Canada, USA, Belgium, Germany, France, UK, Spain, Switzerland, Holland and Sweden. Express Mail Service (EMS) – EMS shipping times are 3-6 business days. *** Please write us your phone number in a message and a courier will deliver it to your given address. Registered Airmail - Standard shipping method. Shipped with tracking code, arrives in 14-30 business days. This is the shipping method we use to send to countries where the Ecopost service is not available. It should be noted that Eco Post is not a courier service and therefore does not require the signature of the recipient at the time of delivery. The shipping times mentioned above are estimated and can take longer depending on customs and security clearance times. We cannot be responsible for unanticipated delays. *We combine shipping for multiple purchases. Tracking code for your shipment will be sent to your email address as soon as your purchase has been shipped. If you purchase goods from abroad, Customs Duty and/or Import VAT may be due. It is the responsibility of the buyer to pay those fees. If your PayPal and Etsy addresses are different, please let us know which one is the correct one in the "message to seller" box at checkout. Otherwise - your purchase will be sent to your Etsy address. Feedback is always appreciated. If you have any concerns, we would be happy if you could let us know BEFORE leaving a negative feedback. We will do our best to sort it out so we can both be happy with the transaction. As all items are handmade, the item in the photograph may vary slightly from the item you receive. Natural gemstones may slightly vary in color from the ones photographed. We welcome Wholesale purchases - please contact us for more details. To fulfill your order, you must provide us with certain information (which you authorized Etsy to provide to us), such as your name, email address, postal address, payment information, and the details of the product that you’re ordering. You may also choose to provide us with additional personal information (a phone number for express deliveries, for example), if you contact me directly. •	Service providers - We engage certain trusted third parties to perform functions and provide services to our shop, such as delivery companies. We will share your personal information with these third parties, but only to the extent necessary to perform these services. No personal information is transferred other than the information described above. •	Change, restrict, delete. You may also have rights to change, restrict our use of, or delete your personal information. Absent exceptional circumstances (like where I am required to store data for legal reasons) we will generally delete your personal information upon request. •	Object. You can object to (i) our processing of some of your information based on our legitimate interests and (ii) receiving marketing messages from our after providing your express consent to receive them. In such cases, we will delete your personal information unless we have compelling and legitimate grounds to continue using that information or if it is needed for legal reasons. We cannot accept returns for custom sized rings. Please DO NOT simply guess your ring size. DO visit a professional jeweler or a jewelry counter to have your finger sized. Keep in mind that the width of the ring will also influence how the ring fits, so it is best to know how wide you want your ring to be before visiting the jeweler. 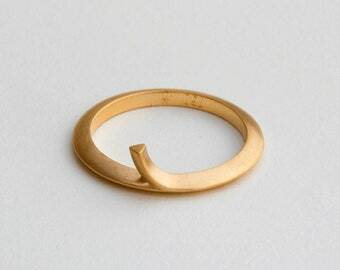 Most of our rings are available in various widths. Please take in consideration - we customize each ring to your size. Custom orders can be made. We will not copy another artist's or licensed work as a custom request. Minimum for wholesale order is 5 items or $600. Can I pay with a credit card through PayPal if I don't have a Paypal Account? Yes! you can pay using any credit card through PayPal, if you don't have a PayPal account (no registration needed!). If your PayPal and Etsy addresses are different, PLEASE let us know which one is the correct one. You can also write a European or English finger size in the "note" under your order tab. Is this item available in rose / white / yellow / 14k / 18k gold? Yes! 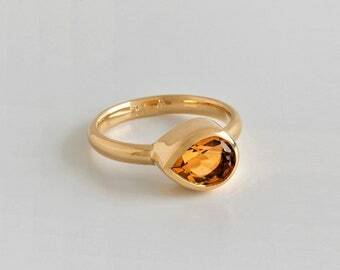 Almost all of our designs are available in 18k and 14k gold - white / yellow / rose solid gold. Please note - 14 karat gold, 18 karat gold and 22k gold have a different color. *We chose 22 karat gold for our weight pendants, for its high density and great color. Is this jewel available with other gemstones? Yes! We offer a large variety of gemstones, in all sizes and shapes. Let us know what you would like, we'll check if it's possible. Are import duties, taxes and charges included in the item price or shipping cost? Any customs, Import duties, taxes or other fees are the full responsibility of the buyer and are not included in the item price or shipping cost. We have no way of knowing how much taxes you will be charged. Please check with your country's customs office to determine what these additional costs will be prior to buying. However, we've had great luck with packages arriving safely and on time. Please be advised that purchases coming into the UK are charged a 20% VAT when the cost of the item is over £15. There is also an £8 handling fee from the UK post office. They are pretty strict on it and few escape this tax. 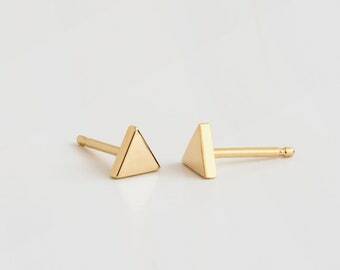 I was wondering if you could make the earrings in white or rose gold and with screw backs? Yes we can make all jewelry in our shop in white / rose / yellow gold at the same price. Screw backs have an additional charge of $12.